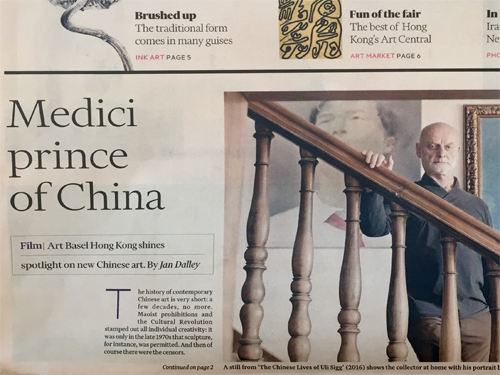 Entitled “Medici prince of China”, the Financial Times published Jan Dalley’s article on “The Chinese Lives of Uli Sigg” on March 20. Dalley introduces the documentary as one of more than seventy movies by and about artists shown at Art Basel Hong Kong. Please click here to download Jan Dalley’s article. In his contribution to The Art Newspaper, Javier Pes states that after “Bird’s Nest”, the documentary on the Olympic Stadium in Beijing, “The Chinese Lives of Uli Sigg” is Schindhelm’s next “Swiss-Chinese saga”. Please click here to read Javier Pes’ article online.